Working on my new Intermediate Quilting Course! So I came up with the idea of this as a group of classes which I ran three years or so ago. They were fun and challenging. I couldn’t keep it up as things at home were also becoming challenging. So had to stop running them. So have decided to run the new 2014 Interediate Quilting Class the same way I do the Beginners and the Beyond Beginners Classes – by making a Sampler Quilt where each of the block uses a different technique. 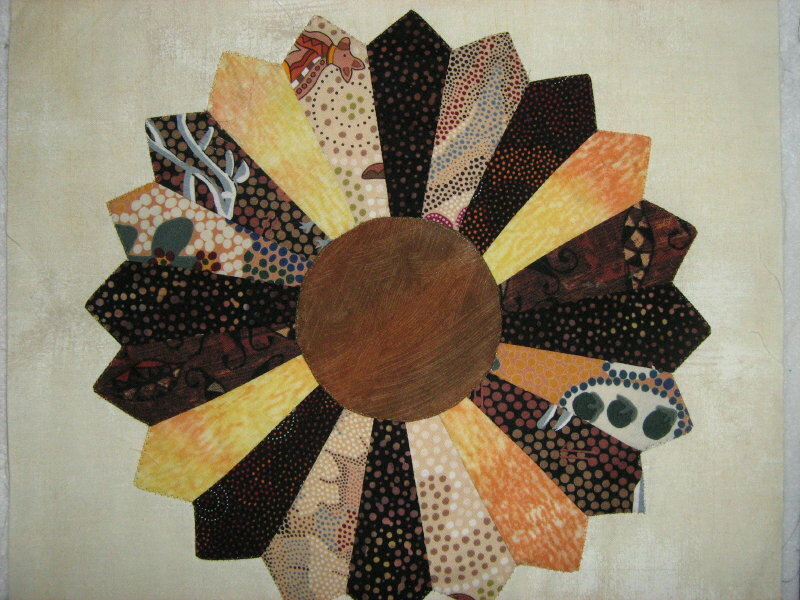 So we will be making blocks that include – Bargello; Celtic Knot; Dresden Plate; a Lone Star Block; a Machine Applique Block; a Box Block (to include inset seams); Sashiko; New York Beauty; a wedding ring block and finally – a pieced Leaf Block (working with half-square and quarter square triangles. A couple of blocks of the quilt so far! I am really excited about the course and already have 5 people booked. Hope to have at least a couple more but will take up to 10. I haven’t decided what the order will be but am busy making blocks, but will start out without challenging the group too much – take it easy to start until I know what the gals (and guys if any want to join!) are up to and how fast we can go. We will meet the last Friday morning of each month – 9.30 – 1.30 pm starting on 31st January. Must get on – I need more Australian fabrics, so if anyone knows where I can buy some here in the UK, could you let me know please? Keep watch of this space! Well, I really have over done it this time! I do love my quilting but there is just too much going on these days! 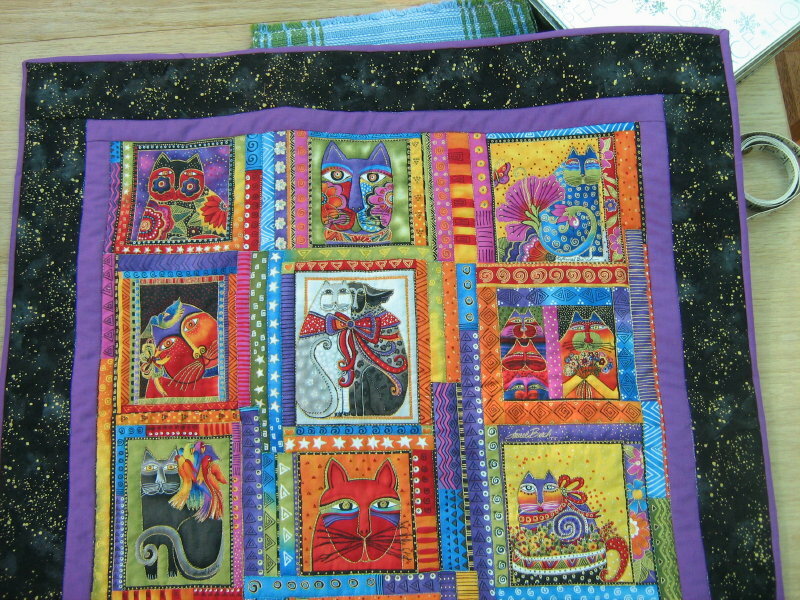 In the last month, I have made this cat wall hanging for my friend’s 60th birthday. Finished off preparation for another Getting to know your sewing machine course; delivered a Mach ine Quilting class; began another Beyond Beginner Class. 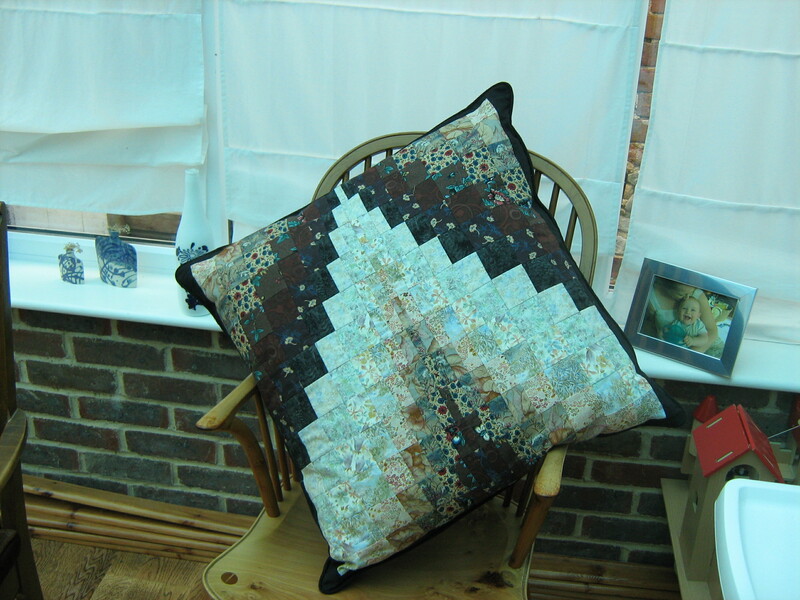 I delivered a Bargello Cushion workshop and today organised the sale of fabric which were given to the Storrington Quilters by the family of a woman who has gone into a home because of demintia. I think the Quilter’s Guild will be taking the rest of the unsold fabric for their sale later in the month. I keep my fingers crossed since I have certainly run out of storage room Still a lot has been sold, thank goodness! They did well out of the sale of the fabrics. Must leave it for now!! Well I have finally made the time to make my Twister quilt and about time too! I am running a class on the 25th October and hadn’t made one yet to help sell the class to all those who might wish to take the class! It is far easier to make than I thought, providing as a sewer, you are careful and systematic in your work. Some good squares, a sharp rotary cutter and a quarter inch foot and you are away. Come join me in the class, you will have lots of fun. I am now about to make a Christmas Tree Twister Quilt since the class is in the run up to Christmas, and I suspect the students will want to make one for the holidays. 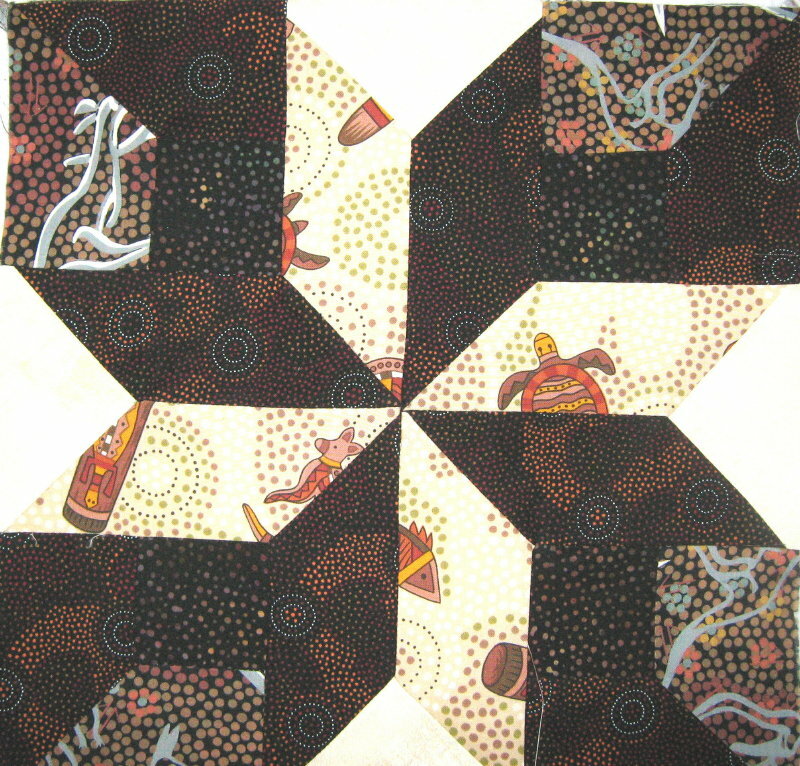 Storrington Quilters Christmas Quilt is about to be quilted, in time for November hanging of the quilt. 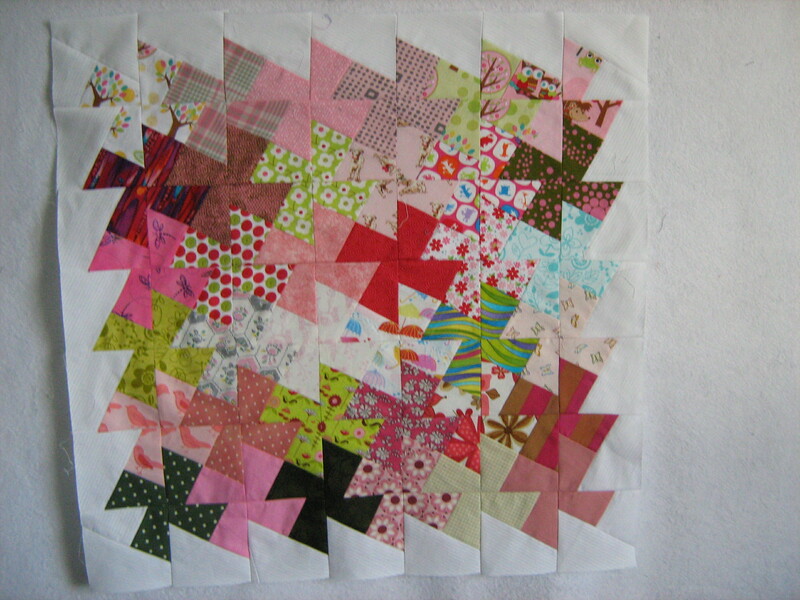 Each of us in Storrington Quilters has made a block for the Christmas Quilt we are making to hang in The Old School. We have in the past made a Spring Quilt (soon to be replaced, as it is the first seasonal quilt we made some years ago and too small for the space allocated to us); an Autumn Quilt, now hanging in The Old School; and a Summer Quilt – the latter two are really fantastic examples of the great work Storrington Quilters can do.